Interview with Shobita Parthasarathy | Official website of the Science, Knowledge, and Technology section. 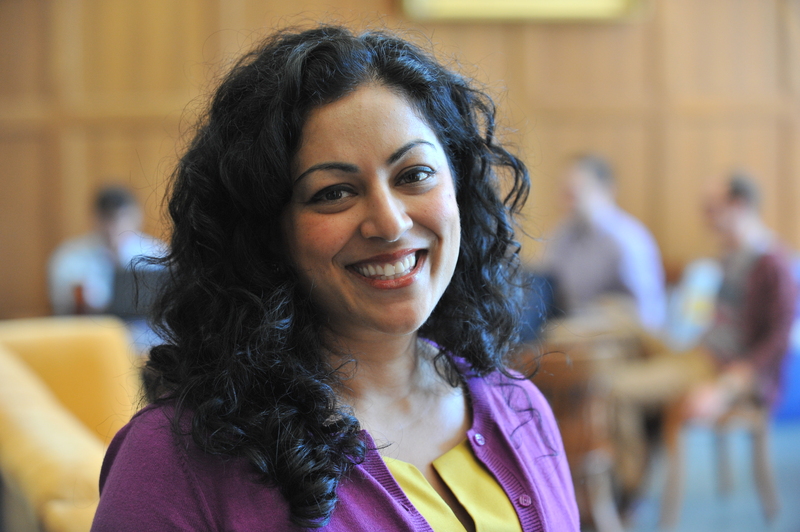 In October 2017, Jennifer Singh had the pleasure of meeting and interviewing Shobita Parthasarathy, Professor of Public Policy and Women’s Studies, and Director of the Science, Technology, and Public Policy Program, at the University of Michigan. Jennifer met with Shobita while she was visiting Georgia Tech’s School of Public Policy to discuss her recent book, Patent Politics: Life Forms, Markets, and the Public Interest in the United States and Europe (University of Chicago Press, 2017). Patent Politics compares recent controversies over life form patents in the United States and Europe and demonstrates how political culture, ideology, and history shape patent systems in fundamental ways. Her first book, Building Genetic Medicine: Breast Cancer, Technology and the Comparative Politics of Health Care (MIT Press, 2007), compared the development of genetic testing for breast cancer in the United States and Britain. Findings from this book helped to inform the 2013 U.S. Supreme Court case over gene patents. The interview started with how Shobita came to STS after receiving a biology degree from University of Chicago and working in Washington D.C. in the White House Advisory Committee on Human Radiation Experiments. Given her background in science and interest in critical issues in science policy, STS was a natural fit. She then shared with us her experiences in being a part of the June 2013 U.S. Supreme Court decision that invalidated the U.S. patents on BRCA1 and BRCA2. Our interview ended with insight into her current research on the use of innovation to alleviate poverty and inequality, with a focus on India. Singh: Tell me about your pathway into science studies? Parthasarathy – I was always interested in law and policy. But I was good at science and then I was kind of galvanized by the Human Genome Project. I remember sitting there in some bioethics class in college at the University of Chicago, and realizing that it brought up interesting moral and social questions, and we needed to develop answers to regulate the new area of technology. More generally I just realized that there was a lot of emerging science and technology that raised serious issues, and needed regulation, but it wasn’t clear how this should be done. I wanted to think more critically about science and technology policy and how to make sure it benefitted society. Singh: Is this what led you to work in Washington D.C. on human radiation experiments? Parthasarathy: Yes. My first job in D.C. was pretty amazing for a first job out of college. This experience really piqued my interest in the political nature of science. I think I had that critical eye but the light just switched on and then I couldn’t turn it off. Then when I was looking for Ph.D. programs, I couldn’t find anything that really addressed these interests and I stumbled on Cornell’s STS program and I read people’s bios and I didn’t totally understand what they were saying but I was like, okay I think this is right. Parthasarathy: Yeah. It was natural. It was really natural but I had not been trained to think that way. I mean it’s so interesting for me now because I direct the Science, Technology, and Public Policy Program at Michigan and so I deal with a lot of students and graduate students in science and engineering and it is such a wonderful moment when they see the social and political construction of science. I mean I know that for them sometimes it can be really fraught. I’m sure you’ve had this too when you flip the switch and they get it and they’re like, “Oh, wait a second, what am I doing.” On the one hand once they see it they can’t unsee it, and they become these extraordinary thinkers and they go to D.C. and do this amazing stuff. On the other hand I know that it’s hard because everything that they know gets turned on its head. Singh: Science is not objective, science is not value free. Parthasarathy: Yeah. I mean when it comes to these kinds of matters of innovation policy, too, it’s very difficult to be making arguments about how maybe it’s not really these systems that are in our interest. I mean I did that in my first book too. People would say, “Myriad Genetics, the company that held patents on the breast and ovarian cancer genes, is evil,” and I said, no, maybe our systems are structured in such a way that Myriad exists and that’s the issue. Myriad is just generally smart. Singh: What are your thoughts about the 2013 U.S. Supreme Court decision that invalidated patents on two genes associated with hereditary breast and ovarian cancer, the BRCA genes, in response to a lawsuit filed by the American Civil Liberties Union (ACLU) and the Public Patent Foundation (PUBPAT)? This came after your first book. Parthasarathy: I write about it a bit in my second book. I was involved in litigation a little bit – a lot actually. On the basis of my first book, the ACLU asked me to write an expert declaration for that book and the expert declaration got cited a lot in the Supreme Court decisions. This was pretty amazing. Singh: Were you nervous about writing the declaration? Parthasarathy: Yeah, because I was untenured. Singh: Okay. So you were concerned about the political nature of writing the expert declaration? Parthasarathy: Yeah. What made me feel better was that I was just about to go up for tenure so the decision was not exactly coterminous. I was also lucky because I didn’t have to be political really; the political act was in submitting the declaration. I had to do zero extrapolation since I was simply reporting the results I had already discussed in my first book: the BRCA gene patents clearly had negative implications for research and health care in the United States. Parthasarathy: Yeah. Since then, yes, I have become a little more engaged in public and policy discussions but that was the first major moment and I remember as it was happening – I was getting more calls and I was getting requests and I wasn’t doing much. I wrote one piece but then I realized that if I didn’t write the declaration I would regret it for the rest of my life. I had been involved in the discussions with the ACLU as they were developing the case and I had helped them along the way. I had one friend at the ACLU who emphasized that this was a major moment in my life. Singh: And you couldn’t ignore it. Parthasarathy: So my take on that ACLU decision is that it is a decision about the product of nature doctrine in patent law. It’s not a decision about access to research tools or healthcare. It is also the result of the ACLU being a singular entity that is both an outsider to the patent system and could therefore see the injustice more clearly, and an insider that could play the games of legal standing and legal argument. In the second book I talk about how the ACLU carefully played the game along the way. Singh: They are not prevented by the expertise barriers that you talked about in the second book but actually get on the inside. Parthasarathy: They find the holes in the barriers that usually keep outsiders out of the patent system. If you think about it as a fence, the ACLU figured out how to traverse this little thing and squeeze in and that’s why they never got taken seriously. That is what’s important; the ACLU didn’t get taken seriously because they were assumed to be an outsider, and the insiders assumed that the barriers would hold. That’s another way to think about it. The assumption from Myriad and the Patent and Trademark Office (PTO) was that the barriers would hold and in fact at that first stage they did not take the ACLU seriously at all. In fact that was the moment when they needed to be taken seriously because the district court judgment totally excoriated the patent holder. So then Myriad was shocked and even then, Myriad and the PTO were still expecting that the Supreme Court would not take the case and that the appeals court would reverse the district court decision, which they did because the appeals court is always a pro-patent court. I think that they didn’t expect that the Supreme Court was ever going to get the case. After I attended the Supreme Court hearing on the case, my sense was that it was fairly certain that the Supreme Court would overturn, but they were not asking questions about access to healthcare. A couple of justices asked questions about research and competitiveness. So they were thinking about policy questions too. But at the end of the day they only cared about this question about product of nature. That is, is the gene a product of nature, or a technology? The hilarious thing is there is a whole discussion in the Supreme Court hearing about a magic microscope. The question was, if you had a magic microscope and you could see into the body, to what extent is the gene that you could see in your magic microscope the same as the gene that was isolated, purified and patented? If they’re the same then the gene shouldn’t be patentable because it exists in nature. But if they are different, then the gene is patentable. Interestingly the European Patent Office revoked the European BRCA patents long before the U.S. Supreme Court case, but because of different reasons. They allowed gene patents overall, but revoked the BRCA patents on technical grounds. But the Europeans also take the potential research and health care impacts of gene patents seriously, through compulsory licensing legislation and other kinds of things. I argue in the second book, then, that even though the U.S. looks more restrictive than Europe in the gene patent case, there are still very different political ideologies and environments that shape these legal decisions and their consequences. Singh: So is the second book out? Singh: Maybe you could just tell me what led you to focus on a comparative analysis of patents processes and what led you to the specific cases you highlight in the book. Parthasarathy: So I guess I’ll talk about it in two ways. The first is the specific case and the second is why a comparison. So the first question about the specific case is related to the first book. When I was doing the research for the first book I went to the opposition hearings challenging the BRCA patents at the European Patent Office and when I first went to them I thought they were so odd. My first inclination was that such a thing would not exist in the U.S. I was partially right and partially wrong. I was wrong because there had actually been a robust controversy in the U.S. but it had been shut down and reanimated in different ways. But I was partially right because that kind of institutionalized form doesn’t exist in the U.S. and that is also something that I sought to explain. The question eventually became why do these places think about life form patents so differently not just in terms of legally but at a more fundamental level politically and socially? Why do these different kinds of expertise get invoked? Why are there different kinds of institutional practices, different kinds of actors, and also different kinds of interests that emerge in those places? These were the questions that prevailed. But the second question about comparison is that I find comparison to be a really useful tool and especially for science and technology because we in science studies or social studies of science and technology, are always in a position where we have to demonstrate that something that’s taken for granted, black boxed, neutral and objective is social and political. Comparison, I think makes that process a little bit easier and it forces me to keep interrogating the object. I found that very much to be the case even more so in the second book than in the first book, which is also a comparison. In the first book, the object is stable. I was trying to understand a genetic testing system. In the second book, the object wasn’t stable and I had to keep asking new questions relatively late in the process. I think after the book had gone through the first round of review that I realized that it wasn’t just that the systems were different and the patents were different; it was that actually the interests were totally different too, so that was also something that I had black boxed. I had fallen into the positivist trap of assuming interests were identical but quickly realized that’s also something that needs to be explained. I wouldn’t have known to open that up if I hadn’t had to keep looking at these two different processes and keep asking myself, “why are these things similar or why are these things different?” In addition, I think if I had only focused on one place I’m not sure that I would have been able to get the variety of ways in which the context shapes the objects that I was trying to explain and as I said also influences the shape of the objects not just their presence or absence. Parthasarathy: Yes, but it looks much more broadly at the whole history of controversies over life form patents in the United States and Europe. So, it starts with the first debates over life form patentability, and then looks at controversies over patents on genetically modified plants and animals, stem cells, cDNA, and then finally human gene patents. Singh: Do you think the Supreme Court decision really changes much because cDNA is still patentable? Parthasarathy: So there’s a paper that just came out that says that in fact it did. I was skeptical but it sounds like the patent office is taking it seriously and so it is not allowing certain kinds of claims anymore. So in that respect it is, but that was a narrow analysis. My suspicion would be that the companies are just finding other ways to patent, which is smart and is fine I guess. I think the other thing that people say is that it’s also less of an issue because you’re no longer looking at single gene tests so the importance of that decision is yet to be determined. Singh: Now we have chromosomal microarrays and human genome sequencing that analyze hundreds if not thousands of genes. Parthasarathy: Right. That’s part of why the fact that the U.S. Supreme Court decision wasn’t about these broader ethical and social questions is a problem. I mean it doesn’t capture the broader set of questions, which hasn’t gone away. We don’t have any systematic way of regulating anything. We cannot figure out a systematic way to regulate genetic testing. In my first book I sort of joke about the parade of advisory committees. You could argue that from the 1970’s they have been offering systematic methods for regulating genetic testing. Singh: And nobody has followed it. Yet, there is always a new committee. Parthasarathy: Every new committee begat another committee and now people are concerned with 23andMe. The FDA’s approach to 23andMe did not actually suggest they had developed a systematic approach. They just regulated what 23andMe could say about what it was doing. It’s sort of like an on/off switch rather than a systematic approach. In the book I talk about the Human Fertilization and Embryology Authority in Britain as being another model. So now they’re part of National Health System (NHS). I think they were a separate institution now they’re part of the NHS but one of the things I’m fascinated by in this space is how can you think systematically about these kinds of questions in a policy space and what is especially the American resistance to doing so? We are completely resistant to thinking about moral and socioeconomic issues as in any way systematic that could inform policy. Singh: So I’m really curious about your new research in India and how you’re engaging with issues of poverty, science and technology. It was very vague on your blog. Parthasarathy: That’s because it is evolving! I feel like every two weeks it’s getting more concrete. I’ve always been interested in these issues but I’ve come at them indirectly and I think I just reached the point where I want to focus centrally on these questions. So the way that I’ve structured the project is that I’m interested in technologies that are meant to directly help the poor. How do we decide what looks like a good pro-poor technology, and why do we continue to invest in these technologies even when there isn’t necessarily interest among the users? So I’m looking at it in two ways politically. One is institutionally. So I am looking at the new institutions of development at the international, national and local level, at governmental, NGO, philanthropic activity etc., and asking questions such as: How are they structuring these initiatives? What kinds of things are they funding? How do they structure them? Then, I’m looking at four technologies and I come to this with an interest in why it is that invariably these technologies are controversial or mixed at best and useless at worst. So the four technologies that I’m focusing on here, which have been of questionable impact are: clean cook stoves, toilets, sanitary pads and watershed management for agriculture. Microfinance could be fit into this space, local banking could fit into this space and sometimes they work in one context but then they don’t work when they are expanded. That’s often what happens. In fact, some of my preliminary research shows that these institutions are totally focused on questions of scalability and use provocative language, which is appealing for sociologists and STS scholars because they talk about how culture can be changed to fit the technology. It’s sort of like fix the context not the technology. That’s actually the language that the World Bank’s grant making program uses, suggesting that any technology can be scalable so long as it comes with appropriate behavioral or communication strategies. That’s one dimension of it. Then there are the cases. I’ll talk about the sanitary pads example because I think it’s incredibly interesting and I’m in the midst of doing that work now and I’m totally fascinated by it. So I’m interested in how sanitary pads become a development intervention in the first place. I’ve been tracing the intellectual history and what’s fascinating about it is it requires all of this kind of political machinery. It requires a set of statistics that travel with the technology that underline the need for that technology but the statistics are totally disembodied and pretty dubious. I had a research assistant try to trace these statistics and one of the things that I think is super fascinating is that you can have some questionable data that’s never interrogated; data that’s all from one place and partial in these settings they are used to justify certain kinds of policy interventions, whereas in other places the science gets infinitely interrogated. So what is it about this space where it doesn’t get interrogated; it fits neatly into the millennium development goals so everybody’s like “look we have a technology that can solve the problem of gender equity and sanitation” but sanitary pads are generally not used and accepted. And at the same time, the woman is being constructed as backward as non-innovative. Parthasarathy: As unsanitary, as a victim. So they’ll often say traditionally women used rags or ash or cornhusks. So you can use the word cloth that’s the same as a rag. But you don’t use the word cloth, which is important and interesting. But also they neglect to say that most disposable sanitary pads have wood pulp in them, so in fact the most modern technologies also have elements that seem strange. And yet we don’t question that. Parthasarathy: Nobody is saying, women have innovated their way into addressing their menstrual needs in a particular way. Let’s go from the way that women have innovated already to the next levels. I mean that does not seem to be the case. Singh: It’s not the starting point. Parthasarathy: No, it’s not starting there. Instead, they say, look at these social innovators and entrepreneurs, usually male, who are solving this problem for poor and rural women. But that’s also partially because they would never see those women as innovators and if you did you might see the issues totally differently. And then of course there’s the next stage, which I haven’t yet seen in the sanitary pad space but in cook stoves and toilets and you see it elsewhere, is to conduct a randomized controlled trial (RCT). Because yes we agree the development interventions are often failures so let’s do an RCT. Any science studies scholar would say, “okay well this RCT is shaped by the same politics as the original intervention.” The other dimension of this is that India is particularly interesting because it actually often really respects what I call bottom up approaches because that is seen as Gandhian. So there’s traditional knowledge that’s valued in interesting ways but there’s also actual efforts to foster grassroots innovation and entrepreneurship. But those ideas for using technology to help the poor, or recognizing that the poor can produce technology, don’t travel in the way that microfinance and global banking travels. International institutions don’t sanction them and I think part of the analysis has to try to understand what is it about the political machinery that values certain kinds of moveable, scalable interventions over others. So that’s kind of where I am. I now see my work as taking a critical approach to innovation. Innovation is built on this assumption that it, by its very nature, is going help us. I think where I’ve been the most infuriated has been around issues of justice and equity and distributional concerns. In the cases that I’m looking at here, these are usually not interventions that these people asked for. So other people decided that they needed these kinds of interventions; that they needed access to these technologies. The users may say, “No, I want access to those other technologies.” The systems are not designed to address that. The efforts of development scholars, STS scholars, to say participatory methods, deliberative democracy, and to push all of this stuff, that is not being heard. That’s another dimension of this question of who is asking for the access and access to what exactly? My effort is to try and bring a social science lens to these critical questions.